FREE HOOD GRAPHIC WITH THIS BASIC KIT! This kit comes die cut around the design to show your paint color. 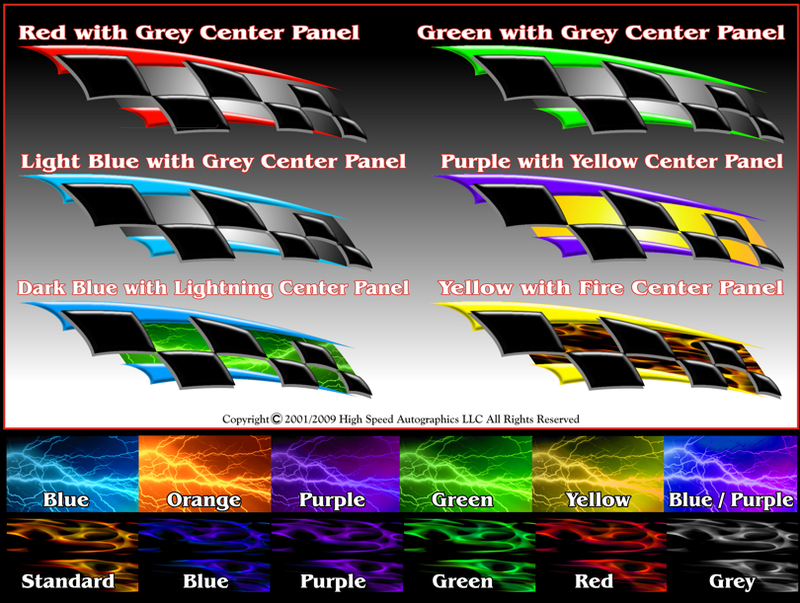 Custom Strakes available in different colors and the center panel can have a gradient fade type color, Fire or Lightning. 3D effect on the Checkers gives the design a large and easy to veiw from anywhere on the track. Comes with matching nose / hood graphic ($FREE). Made from the highest quality 3M brand digital print vinyl with super tuff, high gloss vinyl laminate for extra protection. All numbers are included in the Speedway Aero Kit. Use our digital printed numbers or overlay with speciality vinyl (Hologram, Mirror Lens, etc. extra $60 charge) for an added reflective look. Make sure your track rules allow reflective numbers before purchase. See our Numbers and Lettering Styles specific to Modified Race Cars. Have a specific custom number that you use all the time? We can re-create that number at no charge! Send us the image and we can re-create the number(s) to be added to your graphic design. See the Numbers Styles that are included in our graphic kits. Estimated at $19.99 FedEx Ground (3 to 4 working days). No Signature Required. See our shopping cart on this design of all the shipping options (FedEx, UPS, US Postal Service) with exact shipping cost. We Ship Worldwide!